Text can be put along an arbitrary path. 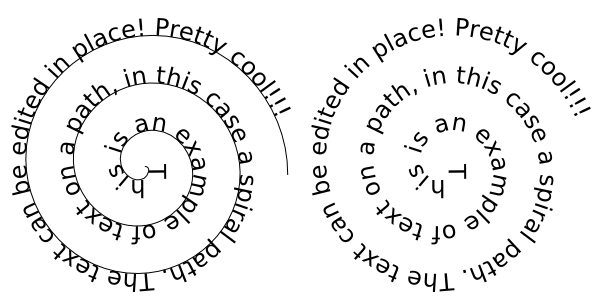 Text on Spiral paths. On the right, the path has been hidden by turning off the Stroke paint. To place text on a path, enter the text as a Regular text or Flowed text. Draw the desired path. Select both text and path, then use the Text → Put on Path command. The text should now appear along the path. Note that Shapes except for Rectangles are described internally by Inkscape as paths and thus don't require converting to a path. Both the text and the path can be edited in place. The text should adjust to any changes in the path. The path can be made invisible by selecting only the path, then removing the Stroke paint with the Fill and Stroke dialog. To select an invisible path for editing, select the text and use Edit → Clone → Select Original (Shift+D). To remove text from a path, use Text → Remove from Path. Parts of the text can be selected and the style, kerning, and so forth can be adjusted as for regular text. Text can also be moved independently of the path by selecting the text only and using the normal means for moving objects. Text can be adjusted or moved relative to the path. Left: the text has been adjusted and kerned with the Alt+arrow keys. Placing the cursor at the beginning of the text and using the Alt+arrow keys will move the starting position of the text. Right: the text has been moved independently of the path by selecting the text only and dragging it to its new position with the mouse. Text on a path is initially placed on the “left” side of the path (referenced from the path direction) starting at the beginning of the path. One can change the direction of the text (and the side it is placed on) by reversing the direction of the path (e.g., Path → Reverse (Shift+R)). If the text is center justified prior to being put on a path, it will centered along the path. To place text on a circle so that it reads from left to right on both the top and bottom, two circles must be used as seen on the left. The larger circle has been flipped horizontally (Object → Flip Horizontal (H)) so the text is placed inside the circle starting from the left. The smaller circle has been rotated 180 degrees. (The path of a circle when first drawn starts from the rightmost point. The circle must be rotated or flipped to move the starting point of the path to the left.) By turning the circles into half circles and setting the text to center-justified, the text will automatically be centered at the top or bottom of the circle. Note that kerning may be necessary as the characters of text placed on the outside of a curve will be too far apart while those on the inside of a curve will be too close together. See the Generate from Path extension for an alternative way of putting text on a path.